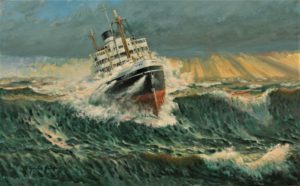 Merchant ships paintings, Shipping, Professional introduces a selection of marine art; any questions? 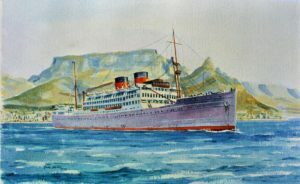 Contents: 1. an introduction; 2. an easy to view selection of paintings with links to individual pages about the ships and the paintings. Commission with confidence, “I’d love another Frickers painting” ~ Sir Robin Knox-Johnston, Master Mariner. > ” B I Sunday”, sold, available in print. 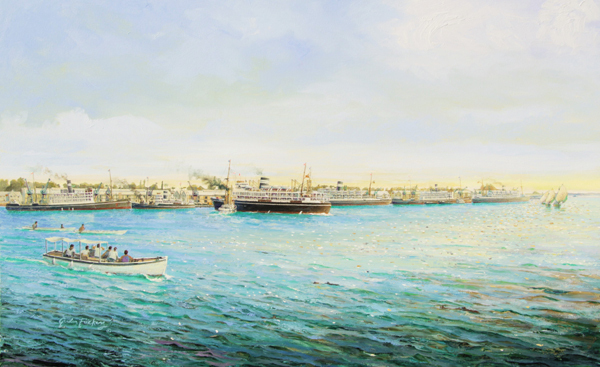 Bamora & Canberra, commissioned, sold, available in print. Hyperlink to > Llangibby Castle, available £500. Hyperlink > Titanic, THE Titanic 38.5 x 46 cm (1 1/4″ x 18″),£1,175. “New and Old” Available and in print. Clansman departing Castlebay, Barra commission, sold, available in print. 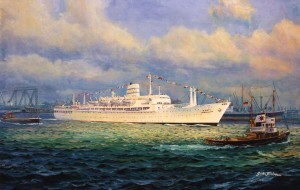 Agapenor at Bombay (Mumbai) available, £975. Rajula at Madras commission, sold, available in print. commission, sold, in print, £147 inc postage. 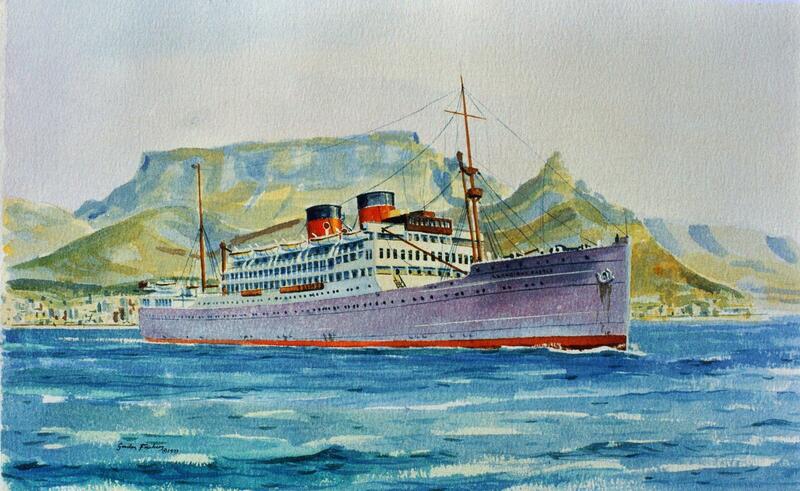 As you see here, I have plenty of experience of painting commercial shipping, payments are usually in easy instalments, I can even advise on your painting as a business expense. 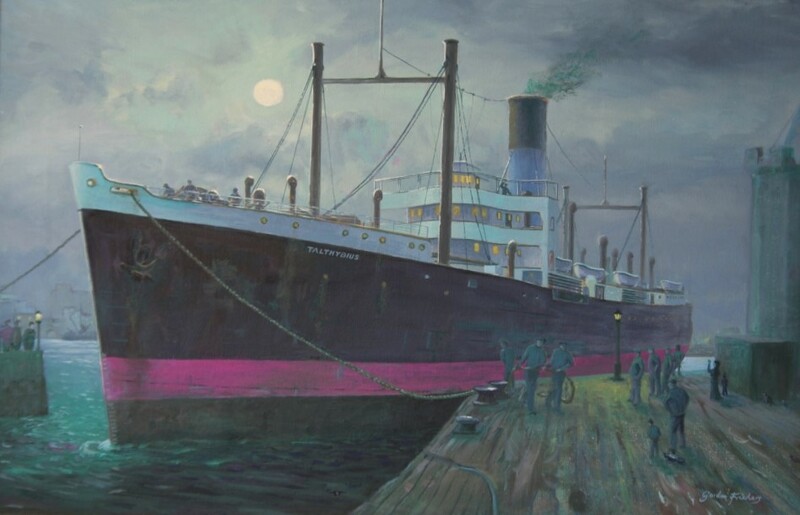 Your commissions could not be in better hands, with a track record of art work being delivered on time and in budget, you can safely choose Gordon Frickers, artist, sea man, a very experienced painter of commercial shipping. Your specifications and budget are quickly sorted by phone or email. If required we can produce an appropriate contract to confirm our agreement. Mr. T.C. Hart, Managing Director of Coe Metcalf Shipping Ltd was presented by British Telecom Marine in appreciation of the excellent work. 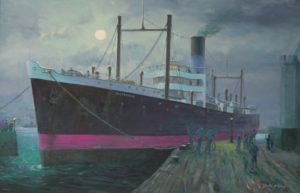 He wrote about “The Cable Ship “Nexus” on the Mersey”. 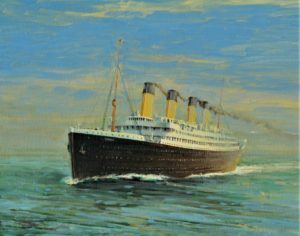 “The composition and the quality of your painting is quite simply stunning and has deeply impressed everyone who has seen it. 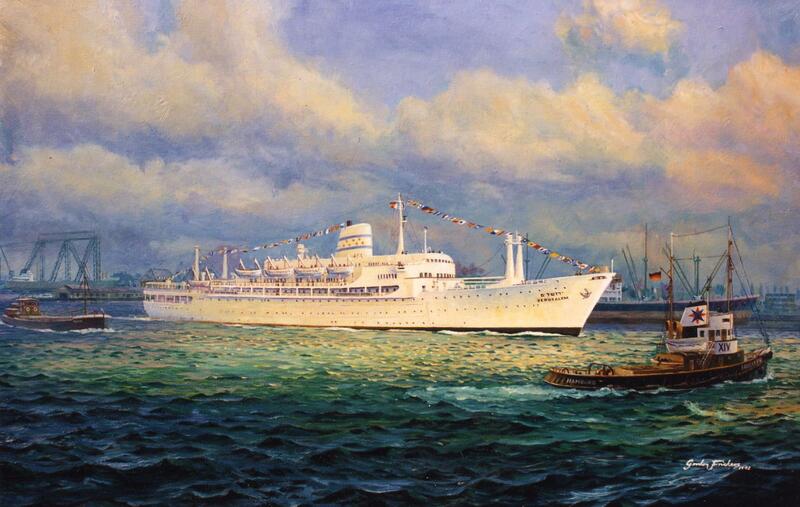 The detail, lighting and colours deserve particular attention; the inclusion of another CMS vessel in the background is a delightful touch as is the choice of venue“. Some of my work is subject to Confidentiality. I understand confidential.